Introduction: The island's bestsellers & most popular activities so varied and endless. For about 3 hours, we give you a peek of how Cebu was in the early years. Accompanied by a professional tour guide, visit the iconic Magellan’s Cross, a symbol of our conversion from being pagans to Christians, the beautifully preserved Basilica Del Sto. Nino Church with the image of the Holy Child Jesus, a wood & stone ancestral house of the Yap-Sandiego family built during the 19th century Spanish regime, drive-thru the oldest street in the country, the smallest tri-bastion Fort San Pedro, the Cebu Heritage Monument describing the eventful saga of Cebu and the scenic Taoist temple where you can have your fortunes told. Light snacks will be served onboard. 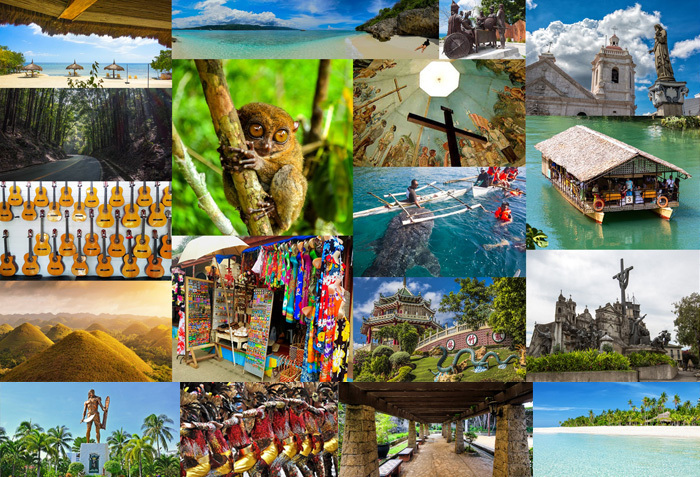 Discover Cebu by getting to know its famous attraction! For about 3 hours, we give you a peek of how Cebu was in the early years. Accompanied by a professional tour guide, visit the iconic Magellan’s Cross, a symbol of our conversion from being pagans to Christians, the beautifully preserved Basilica Del Sto. Nino Church with the image of the Holy Child Jesus, a wood & stone ancestral house of the Yap-Sandiego family built during the 19th century Spanish regime, drive-thru the oldest street in the country, the smallest tri-bastion Fort San Pedro, the Cebu Heritage Monument describing the eventful saga of Cebu and the scenic Taoist temple where you can have your fortunes told. Stop for lunch in a restaurant serving local cuisine. After lunch, proceed to see the Mactan Liberty Shrine where the historic battle of Mactan was waged between the local chieftain and the Portugese explorer Ferdinand Magellan in 1521 and a guitar, fashion accessory and dried mango factory tours to complete your Cebu discovery. A gastronomical 4hr tour to tingle your taste buds. Explore Cebu’s lechon town “ where it was first roasted” and relish your first bite, pair a popular steamed pork dumpling in chili sauce with a “heart” shaped hanging rice and enjoy a flavorful beef shank with bone marrow, a staple dish for those mornin’ the nights (drinking sessions) as the hotness will wake them up from their stupor. Delight in a 3-way seafood cooking commonly called SU-TU-KIL. This portmanteau gets its name from the Visayan words: SU-sugba or grilled, TU-wa – stewed fish in a broth with vegetables and KIL-aw – eaten raw while soaking it in vinegar. Cap of your foodie adventure with our favorite sticky rice, sweet mango and hot chocolate. Your adventure begins upon your hotel pick-up by our professional tour guide. A private1hr (depends on pick-up point)land transfer will bring you to our jump-off point. A 20-minute boa tride onboard a motorized outrigger boat locally called a banca will bring you to Hiultungan Island. It is a protected marine sanctuary and a perfect stop for snorkelling, fish feeding and getting wet.After an hour of swimming and snorkelling, transfer to Nalusuan island and frolick on the white sandbar, visible during low tide. Last stop is Caohagan Islandwith its bamboo cottages dotting the shoreline and white beach, enjoy a picnic barbecue lunch and spend the rest of the day leisurely.Subject to weather conditions. The ultimate water thrill: 25min Seawalker with fish-feeding, a 15min parasail and banana boatride! Includes lunch, towel and use of shower room. An early morning departure from your hotel will bring you to the scenic cool mountains ofCebu and provide a panoramic view of the island. Venture into the Temple of Leah, Cebu’s infamous Taj Majal version. Bite into juicy sweet corn sold fresh along the roads, flower farms dotting the landscape and an exciting zipline. A farm to table lunch experience will cap off your sweet escape before we head back to the city. We recommend you don on a pair of comfortable walking shoes and bring a light sweater for a sudden change of weather. They say if you want to know the locals, get away from the city and explore the countryside. Enjoy a day excursion approximately 40 miles away from the city. Experience authentic village life in a water buffalo “carabao” ride, visit a local shoe making factory, go basket weaving, do the tricycle spin to the market, drink a fresh coconut wine and taste the local dishes for lunch in a grill restaurant. A visit to Carcar wouldn't be complete without sampling its mouth-watering delights, stop at the Rotunda and in the public market and haggle for their famous and delectable chicharon, lechon, ampao, bucarillo, gogorias and puso. Head back to the city after some shopping. Escape from the bustling city to the Danasan Eco Adventure Park, a 2hr drive to the mountain tops north of Cebu. A 167 hectares eco-tourism site, the park offers a variety of activities ranging from wakeboarding, river tubing, ziplines, rope course, caving, waterfall rapelling, trekking, horse-back riding, organic farming and ATV off-road trailing. Choose 4 activities of your choice (you can add more activities on personal account) and spend the day as you please. Lunch will be served at the park’s restaurant and return to hotel mid-afternoon. Certain activities are age-restricted. Children must be accompanied by the parents at all times. Subject to weather conditions. Hidden in the mountains of Barili is the most scenic Mantayupan Falls. A 2 hour drive from the city passing thru fishing villages, rice fields and centuries old churches. Breathe in the fresh air and enjoy a 15 minute trek to the one of the tallest waterfalls in Cebu. Mantayupan has two water levels(14 and 98 meters) where a mini hydroelectric system has been installed to service the needs of the small town. Feel the might of Mantayupan Falls as it plunges about a hundred meters from its peak tothe basin. The drop creates a thundering roar that echoes within an enclave of greens that fills theatmosphere with cooling mists. Further down south is the majestic Kawasan Falls, with its three levelsof refreshing pool waters. A 30-minute easy and enjoyable trek traversing through the wooden hutsand across abandoned bridges, saying hello to the locals going about chores such as doing laundry,seeing children splashing and experiencing the coolness and freshness of this secret paradise. A picnic lunch will be served by the falls. Don on a life vest, hop on a bamboo raft, enjoy the refreshing and relaxing hydro massage. Discover the history, culture and charm of Bohol. Begin your day with a transfer to the ferry terminal for a 2hr ferry ride to Tagbilaran, the capital city of Bohol.The island is famous for its Chocolate Hills– more than 1268 hills inspired in shape by Hershey’s Kisses. Another famous Bohol icon is the world’s smallest primate, the Philippine Tarsier so small they fit conveniently in the palm of your hand. Hop onboard a floating restaurant and start your scenic Loboc river cruise while enjoing lunch. Onwards drive past the reforestation project, the historic Baclayon Church and the site of the treaty of friendship between the Filipinos and the Spaniards. Return to Cebu with a late afternoon ferry and upon your arrival, a driver will be waiting to bring you back to your hotel. Subject to weather conditions. 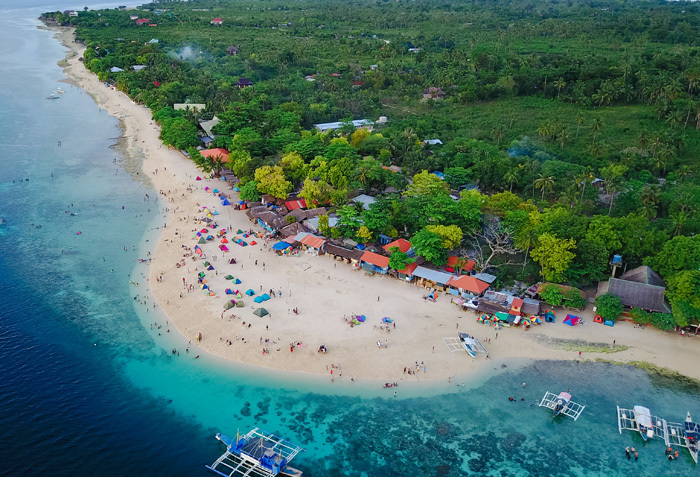 A 3-hr drive passing thru the countryside, old churches, ancestral homes and scenic beaches or approximately 121km south of the city is the town of Oslob, home of these gentle giants. Board a 6-8 seater paddleboat with a boatman rowing out about 2m from the shore and enjoy a30minclose encounter with these whalesharks. A lifejacket and snorkel set will be provided for each guest. Satisfy your hunger pangs with a grilled seafood lunch by the beach or an international lunch at a nearby restaurant after the swim. A short drive away is Aguinid Falls, a five tiered pool and putting your climbing skills to a moderate test. Soak in the refreshing waters then head back to the hotel. Subject to weather conditions. Inclusions: transportation, tour coordinator, fees, snorkel set, lifejacket and lunch. This tour is not for the faint hearted. Early morning departure from the hotel to the southern part of Cebu. 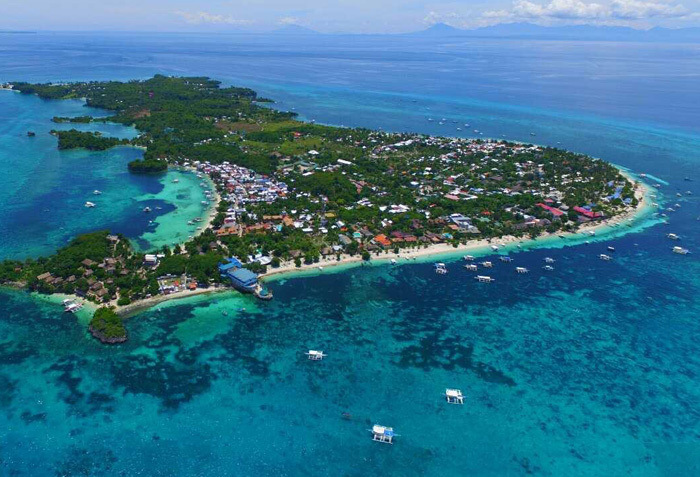 A 3-hour drive passing thru charming small towns, picturesque seascapes and winding roads will lead you to the town of Badian. Upon arrival, enjoy a brief motorcycle ride to the jump-off point. Don on your lifejacket, hard hat, wet suit (or aqua leggings/rash guard), aqua shoes and aqua bag to hold your things (although less is more) and you're good to go! Technical guide will prep you up with the do's and don'ts. Once ready, you move on to the first of many jumps of varying heights 15ft, 30ft, 40ft, 50ft, 60ft or 80ft (Note: Our technical guide will assess your physical capacity. They have the authority to allow you to take the high jumps or not). This downstream canyoneering, perfect for beginners where walking, scrambling, climbing, swimming, jumping and rappelling is expected. You will navigate your way thru Kanlaob River where water is very blue, simply irresistible! Some parts of the river are deep and some are rocky so you better swim carefully. 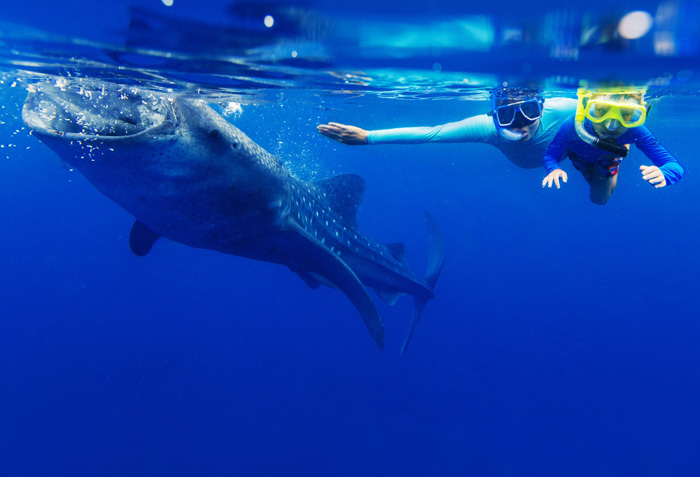 A combination tour of swimming with the whaleshark and downstream canyoneering, perfect for beginners where walking, scrambling, climbing, swimming, jumping and rappelling is expected. Note: Canyoneering is not available for children. They will be allowed to swim in the falls only. Enjoy swimming with the whalesharks and explorethe popular Kawasan Falls, a peaceful natural place where you can swim and frolic in different pool levels. A refreshingway to beatthe tropical heat. Are you ready for this? Enjoy a beautiful sunrise as you travel to the town of Moalboal, a divers paradise. Hop on a boat for a 10 minute cruise to a marine sanctuary and catch "nemo" in action. Corals so alive and waters so clear, explore this underwater paradise for about 30 minutes then our boatman will bring you near to shore where literally millions, yes millions of sardines and sea turtles (seasonality) reside. If you are lucky enough, catch our playful dolphins in action. Proceed to Kawasan Falls, a mere 30minutes away from Moalboal and start an adrenalin rush- cliff jumping, swimming, floating, trekking all rolled into one power-packed activity. Note: Please deduct Php 500/person if only Sardine Run & Kawasan Falls. Travel to the midwest part of Cebu and enjoy a scenic cruise along Bojo River, learning sessions on mangrove ecology, wildlife flora & fauna, mat weaving, snorkeling, swimming and a picnic lunch. Stop at the Capilla Sta. Ana Museum and be struck with its priceless treasures of century old paintings and religious icons. Child is defined between 4-10yrs old. Pick-up timings will be reconfirmed 1-2 days before the tour.